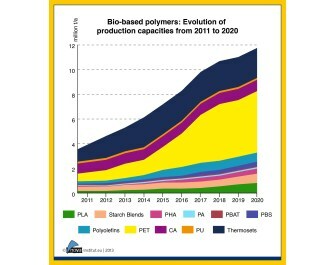 According to nova-Institute GmbH’s latest report, the production capacity of bio-based drop-in PET, PE, PP polymers and the new polymers PLA and PHA will tripe to nearly 12 million tons by 2010. The German research company says considerably higher production capacity was found than in previous studies. The 3.5 million tons represent a share of 1.5% of an overall construction polymer production of 235 million tons in 2011. Current producers of bio-based polymers estimate that production capacity will reach nearly 12 million tons by 2020. With an expected total polymer production of about 400 million tons in 2020, the bio-based share should increase from 1.5% in 2011 to 3% in 2020, meaning that bio-based production capacity will grow faster than overall production. The most dynamic development is foreseen for drop-in biopolymers, which are chemically identical to their petrochemical counterparts but at least partially derived from biomass. This group is spearheaded by partly bio-based PET (Bio-PET) whose production capacity will reach about 5 million tons by the year 2020, using bioethanol from sugar cane. The second in this group are bio-based polyolefins like PE and PP, also based on bioethanol. But “new in the market” bio-based polymers PLA and PHA are also expected to at least quadruple the capacity between 2011 and 2020, according to nova-Institute. Most investment in new bio-based polymer capacities will take place in Asia and South America because of better access to feedstock and a favorable political framework. However, world market shares are not expected to shift dramatically. Europe’s share is expected to decrease from 20% to 14% and North America’s share from 15% to 13%, whereas Asia’s will increase from 52% to 55% and South America’s from 13% to 18%.